The naked vs. The well-dressed... it squeezed its way through my boredom.. LOL. Wallpaper and background images in the 해리 포터 대 트와일라잇 club tagged: harry potter edward severus snape. This 해리 포터 대 트와일라잇 photo might contain 기호, 포스터, 텍스트, 칠판, 사인, 서명, 거리, 도시 현장, 도시의 설정, 도시 장면, 도시 설정, 도시 거리, and 도시 장면 설정. YAY! SNAPE! WE LOVE YOU, SNAPE! I just love it when they put our beloved professor up against Eddiekins. 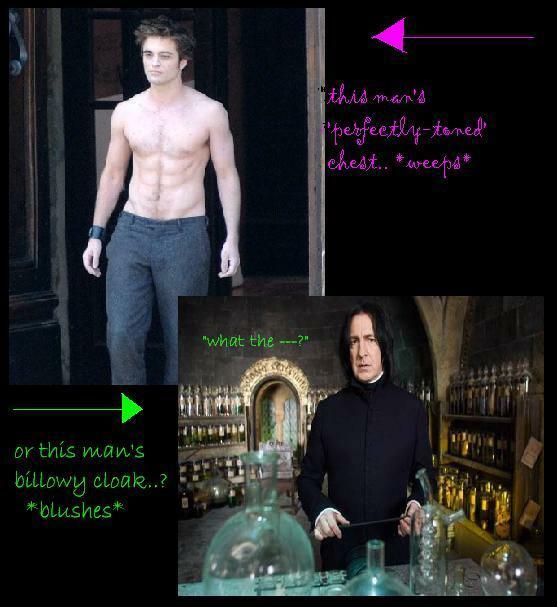 :D Severus is too made of win for him; HE SHALL TRIUMPH EVERY TIME. Muahahahaha. Aaaaah! Get the picture at the top burned down now, please! Just leave the one with Severus, thanks! haha.. thanks for the positive comments for sev guys.. sorry if the picture is not that great.. i only got paint.. but im learning..
those abs are fake, makeup. robbert patterson even said so himself. SNAPE WINNS HANDS DOWN!!!!!!! Snape ! Snape ! Severus Snape ! I can swear he`s looking at me from the computer... OMIGOD SNAPE CAN SEE ME! AAAAAH!